FREMONT, CA –May 25th 2016 - CORSAIR®, a world leader in enthusiast memory, PC components and high-performance gaming hardware today announced the release of its eagerly awaited LAPDOG portable gaming control center. LAPDOG brings full-size gaming keyboard and mouse control to the living room, allowing users to mount their choice of CORSAIR K70 or K65 keyboard (not included) into its aluminium chassis, alongside a gaming mouse of choice. Backed with a removable memory foam lap cushion for supreme comfort in long gaming sessions, LAPDOG allows gamers to sit back on their sofa in front of a big screen TV and enjoy the best and most comfortable PC gaming experience to be had. First shown at Computex 2015 and the winner of numerous “Best of Show” awards CORSAIR Lapdog brings desktop CORSAIR gaming peripheral performance to the living room. A full-size portable gaming control center, LAPDOG allows you to mount your choice of CORSAIR K70 or K65 Keyboard and mouse to enjoy the complete PC gaming experience from the comfort of your couch. Built from anodized, brushed aluminium LAPDOG feels as good as it looks, and with a huge removable memory foam lap cushion is made for comfort as well as style. Weighing just 5.8lbs (2.63 kg), multi-hour gaming sessions are a breeze, with the light-weight aluminium chassis and moulded cushion minimizing weight and pressure. Any CORSAIR K70 or K65 mechanical keyboard fits securely into Lapdog, while a full-size 11in x 11in textured-finish mouse pad provides both precision tracking for optical or laser sensor equipped mice and enough surface area to enable the best gaming mouse experience. CORSAIR is no new-comer when it comes to cable management, and LAPDOG is no exception. 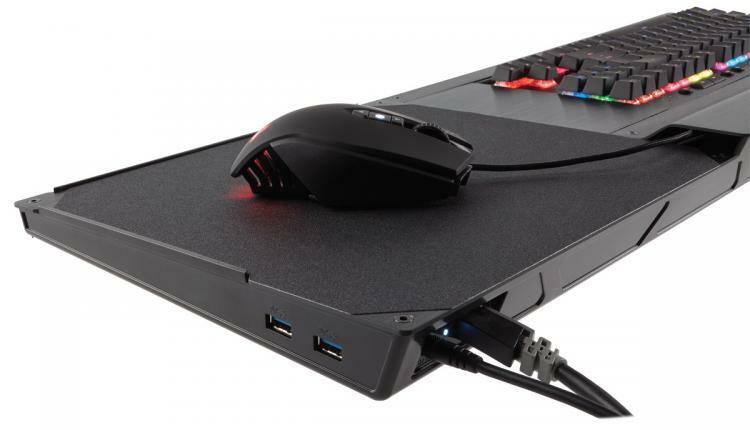 Cables and connectors are tucked away inside LAPDOG’s hidden compartment, along with an integrated powered USB 3.0 hub with four USB 3.0 ports, allowing gamers to connect not just a keyboard and mouse, but also a USB headset, phone, flash drive or any other USB device, all right from their seat. Connected via a 16ft / 4.8m USB 3.0 cable, LAPDOG offers the reliability of a wired connection for maximum performance and minimal latency. Combining the precision of CORSAIR’s industry leading keyboards and mice with supreme comfort and aluminium construction, LAPDOG is living room PC gaming done right. CORSAIR LAPDOG is available immediately in North America, UK, France, Germany and Scandinavia from CORSAIR’s world-wide network of retailers and distributors, as well as directly from CORSAIR.